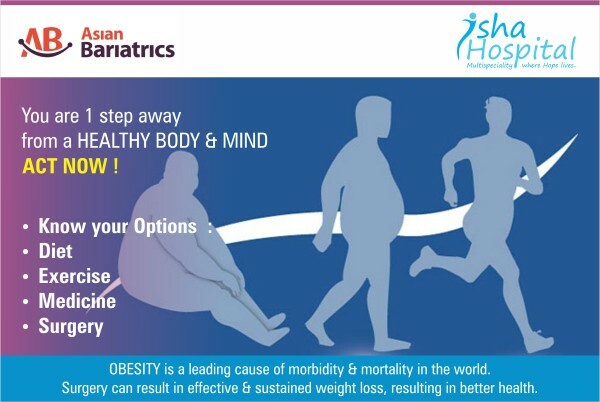 Isha Multispeciality Hospital brings Obesity solutions to Vadodara, in association with ‘ASIAN BARIATRICS of Ahmedabad’ the leading pioneers in the field of Bariatric surgery and obesity managers , who provide state-of-the art treatment for all the ailments of obesity and gastrointestinal tract. Obesity is becoming a global epidemic, which very seriously needs to be addressed. Overweight and obesity leads to serious health issues causing nearly 2.8 million adult deaths each year globally. Effective weight loss plans don’t just stop with eating less food and reducing your caloric value. Along with dieting it is important to follow some exercise regimen for healthy weight loss. We all strive for a healthy Nation .Obesity is eating up our strength and vigour. Lets pledge to eliminate obesity and type 2 Diabetes and help India achieve its dream. Obesity is one of the chronic conditions and is a risk factor for many other chronic conditions. Obesity, one of the chronic conditions is caused by various factors. One or more of the below mentioned factors may cause obesity. The Body Mass Index (BMI) Calculator can be used to calculate your BMI value and weight status while taking your age into consideration. Use the “metric units” tab if you are more comfortable with the international standard metric units. The referenced weight range and calculation formula is listed below. Obesity is a disease, and needs to be treated, else it leads to multiple disorders/ailments, with life threatening repercussions. We offer our patients a treatment with holistic approach. A surgery is only a part of this life altering journey. There is a lot of counselling, medications, diet plans, post-surgery follow ups that are involved for a long term success of a surgery. We ensure relaxing environment for the patient to recover during the stay , and also provide timely follow-ups even years after the surgery. A patient’s diet plan and lifestyle activities are closely followed upon so that he does not face same health issues again. People whose BMI is between, 23.5-27.5 are classified as overweight. If measures to curb this over-weight are not taken in time, a person can easily slip to being obese. A balance of nutritional diet can help them. If your BMI is between, 27.5 – 32.5, you fall into Grade I Obesity category. This is borderline stage where you need to be extremely careful. Gastric Banding and Sleeve Gastrectomy prove helpful with such patients. Grade II Obesity brings along co-morbidities diseases like hypertension, cardiac problems, joint pain, Type II Diabetes. Before this goes to become a case of morbid obesity, it is important to conduct reversal actions. With BMI beyond 37.5, most patients are bedridden; the diets and exercising hardly given any results. Surgery is the only way out. Thus, it is not necessary that every over-weight person needs surgery. If you have any questions regarding your weight condition or lifestyle habits, you are not alone. Contact us for a counselling session in order to understand your condition better.